ISO 22000 : 2005 - Food Safety Management Systems. Including the HACCP system - Hazard Analysis and Critical Control Points. ISO 22000 is an International Safety Management System of food has replaced the Greek ELOT 1416. The aim is to ensure food safety, namely the achievement of safe food products for the consumer. 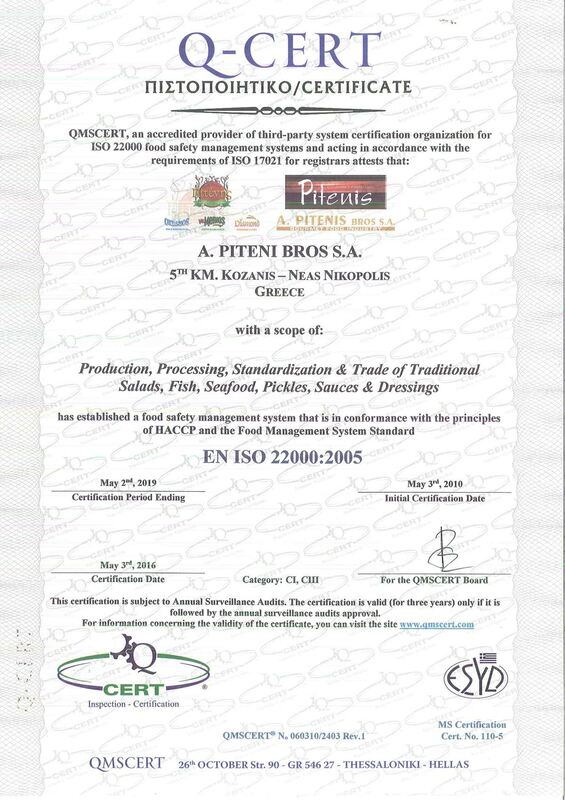 "manufacturing, pack, distribute, remake, store, handling, produce, Carry, Offer for sale food"
History: A. Pitenis Bros S.A. certified by To ISO for the first time 2000. Since then till today renews and enriches the certifications according to each new certification standard to offer the public the increasingly higher quality! Today, is assurance procedures 2 even new, for this, standards, of HALAL & KOSHER. 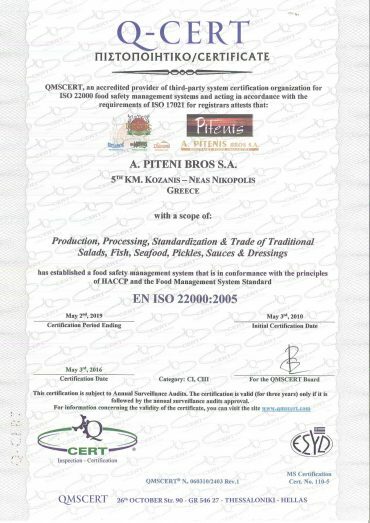 A. Pitenis Bros S.A. certified as to EN ISO 22000:2005 the following areas: Production, Packing & Movement Traditional Salad, Pickle, Fish and Dressings, with the first try and extent 98% (higher level) without having to undergo any comments! .Click on a document for more details.